Well, the Buckeyes survived, and so did the thousands of Buckeye fans sitting in the sweltering confines of Ohio Stadium on a hot August day. We got to see glimpses of a potent offense, some less than stellar play during the second and third quarters, and the first Script Ohio of the season. All in all, a good day. Although the Buckeyes won over a game Buffalo squad, 40-20, the team has a long way to go. The offensive line struggled and at times the defense did, too. It wasn’t clear whether it was jitters or blown assignments or the difficulties that you often see when players start a college game for the first time, but it’s something that the coaches we need to work on. If ever a first game presented a coaching opportunity, this was it. At today’s Ohio State-Buffalo game, Ohio Stadium will be a sea of scarlet and gray. Countless fans will be wearing their Ohio State jerseys to add to the color and pageantry of college football. People living outside Columbus may not realize, however, that an Ohio State jersey is not something that you wear only to football games. No, it’s clearly a much more versatile garment from a fashion standpoint. This summer Kish and I were sitting in the airport and I noticed a guy wearing an OSU jersey — and a blue blazer, too. I’ve seen college girls wearing ultra short jerseys or tied off jerseys to achieve the bare midriff look. On the Fridays before games, you’ll see clerks behind counters wearing their jerseys, and scarlet and gray-clad office workers coming out of their buildings for lunch. Men and women, boys and girls, they’ll wear their jerseys with shorts, with jeans, with sleeves cut off, and over gray hoodies. People get married in their jerseys and wear them to high school proms. I don’t think I’ve personally seen someone wear a Buckeyes jersey with a tuxedo — but give it time. 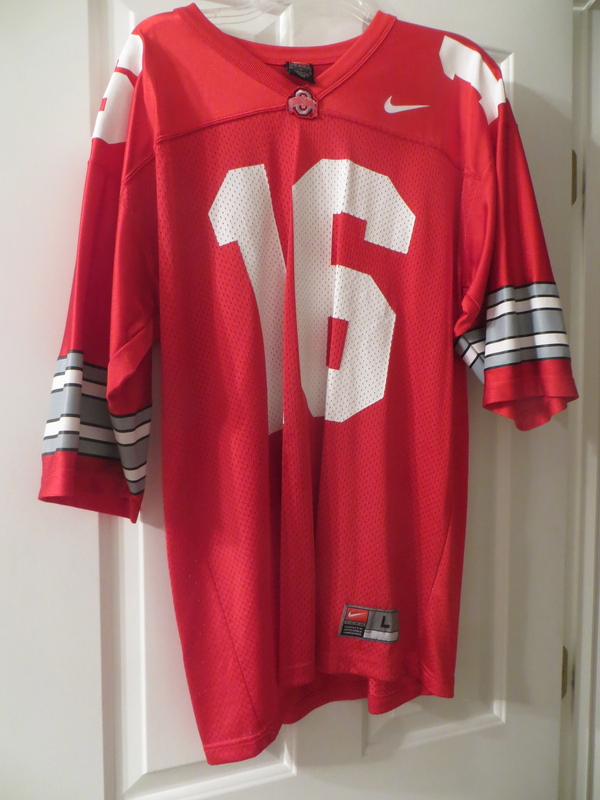 Unfortunately, not everyone looks good in an Ohio State jersey — which is why I don’t own one. It’s an article of clothing made for athletes in peak physical condition, after all. It doesn’t look quite as compelling when its tensile fibers are straining to cover a serious beer belly and the too-tight fit gives the wearer an unfortunately revealing, molded look. We’ll see some of that today, no doubt . . . but it’s just the price you pay to be an Ohio State fan. This afternoon I stopped by the North Market to pick up some wine and cheese to consume tonight — it is a holiday weekend, after all — and I picked up a flier for the Columbus Microbrew Festival. It’s the 8th annual Festival. The 8th! I’ve been blissfully unaware that the Festival even existed, so I’ve missed the first seven. The very thought gives me an empty, gnawing feeling. As any reader of our little blog knows, I am a big supporter of local businesses and downtown activities. I also love beer, so the Festival is right up my alley. My question to our readers — and I’m thinking here of the Biking Brewer — is: what is appropriate behavior at a Microbrew Festival? Are attendees supposed to sip the brews and comment daintily on the “nose” and whether the taste has hints of raspberry and anise, or is it acceptable to guzzle every adult malt beverage within reach and thank the ancient gods that they taught the fine art of brewing to our ancestors? I’m also very intrigued by the names of some of the microbrewers who will be participating in the Festival. Who wouldn’t want to sample a porter brewed by Weasel Boy Brewing Company, or Thirsty Dog Brewing Company, or Seventh Son Brewing Company? What central Ohioan wouldn’t feel compelled to sample the product of Mt. Carmel Brewing Company, or Buckeye Lake Brewery? If you’re intrigued, too, mark your calendars — the Festival is September 13, 14, and 15 at the North Market. 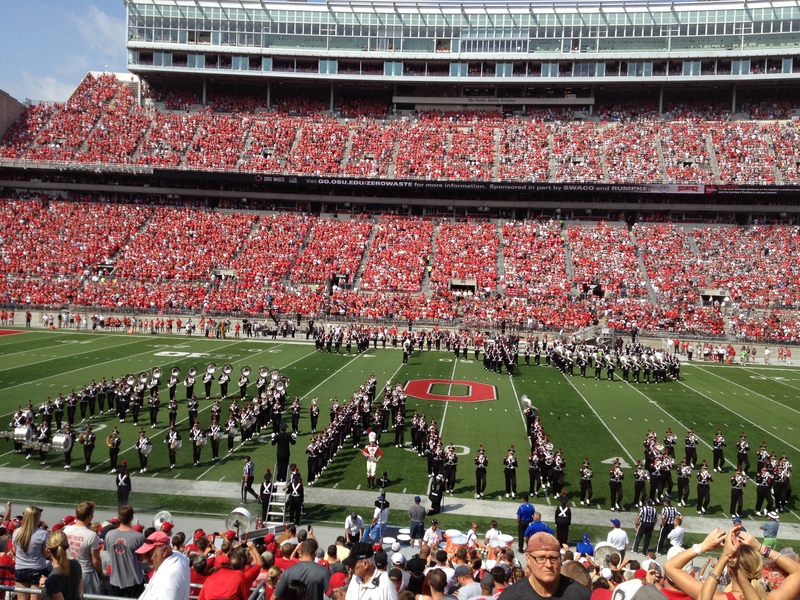 Tomorrow the Ohio State Buckeyes kick off their 2013 football season with a home game against the Buffalo Bulls. 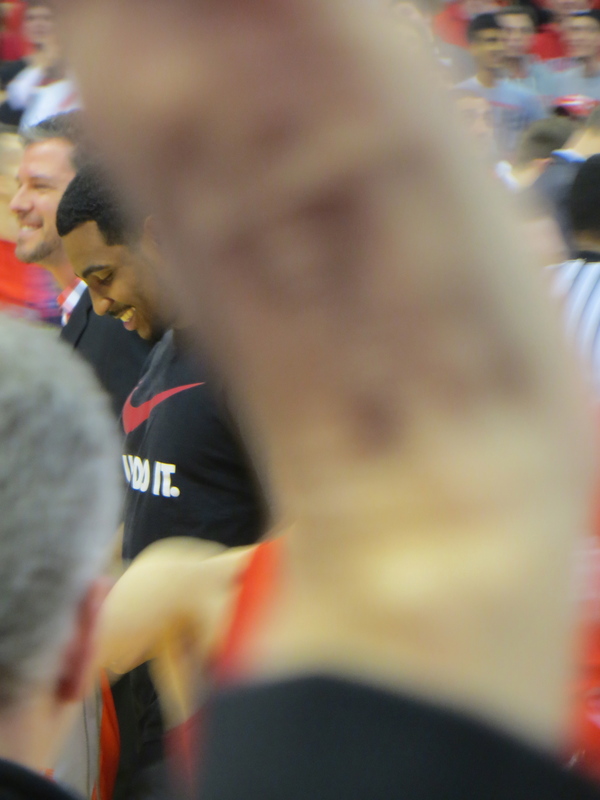 In Buckeye Nation, expectations are high. In fact, “high” really isn’t an accurate description. Many OSU fans think that this team should go undefeated, crush every opponent, make it to the BCS title game, and win handily — and they’ll be disappointed at any other result. Most of the pressure will fall on one man: quarterback Braxton Miller. Miller is the elusive run-pass threat that college coaches dream about, able to convert a busted play into a huge gain through his speed and scrambling abilities. The true believers think that another year of seasoning and practice in the passing game will smooth the rough edges off last year’s erratic passing performances and make Miller an unstoppable scoring force. The fans also believe that the Buckeyes will have a grab bag of game-breaking offensive talent — at running back, tight end, and wide out — and a tough, experienced line. Add in the standard freshman phenom (this year, its speedster Diontre Wilson) and you get the sense that some Buckeye supporters think the offense should score every time it touches the ball. If the offense is a potent as fans anticipate, it probably will be a good thing — because the defense is a bit of a question mark. The defensive line and much of the linebacking crew will be starting for the first time, and while the starters look to be talented, there is no substitute for experience. When the footing gets treacherous in sloppy, Big Ten weather in October and November, scoring machines can grind to a halt. That’s when defenses need to show up and win games for teams that hope to be contenders. Last year the Buckeyes unexpectedly went undefeated, but in the mind of many fans it really didn’t count because the team was ineligible for the Big Ten championship game or any bowl contests. If the Buckeyes are to make it to the national championship game this year — when they are playing a soft schedule — they’ll need to win every game again. That’s a tall order by any measure. I can’t remember the last time a college team did it, and I’m not counting on it happening this year, either. We’ll start to find out tomorrow. I’ll be there in the Horseshoe, ready to cheer. Let’s go, Bucks! Edward Snowden’s leaked information continues to gradually make its way into the public eye. Yesterday the Washington Post ran a carefully worded story discussing the “black budget” for U.S. intelligence agencies for fiscal year 2013. It’s called the “black budget” because very little light is shed on what the intelligence agencies are actually doing with the money they are receiving. And it’s a lot of money. According to the Post story, the “black budget” for fiscal year 2013 was an eye-popping $52.6 billion. Spending on intelligence has skyrocketed since the September 11 terrorist attacks, and you get the sense that the intelligence community saw the attacks as an opportunity to expand their manpower, their budgets, and their influence. They were hugely successful. There are now 16 federal agencies involved in intelligence gathering, and they collectively employ more than 107,000 people. The Post story focused on areas where the intelligence community apparently is unable to provide much meaningful information — like North Korea — but I think the real story is the size of our spy operations. From the President on down, I’m skeptical that there is much in the way of meaningful oversight of what those 16 different agencies are doing — to say nothing of coordination of their activities. How much assurance can we have that the agencies are complying with laws and directives, including those that prevent routine intelligence gathering about Americans engaged in domestic activities? Size and money may allow you to buy neat spy gizmos and establish operations in faraway lands, but they also have a disadvantage. Benjamin Franklin is quoted as saying: “Three people can keep a secret if two of them are dead.” The more people involved in secret activities, the less likely it is that they will remain secret for long. With 107,000 people involved in intelligence gathering, is it any wonder that our government leaks like a sieve and people like Edward Snowden can collect and disclose reams of classified information? On the eve of the 2013 regular season, the National Football League and lawyers representing certain players have reached a preliminary settlement of claims concerning concussions and other head injuries. The player lawsuits alleged that the NFL had hid information about the effect and potential dangers of head trauma. In the proposed settlement, the NFL doesn’t admit any liability, but agrees to pay $765 million. The money will be spread among more than 4,500 players and payments of the money will be made over 20 years, with half of the settlement proceeds being paid in the first three years. According to the New York Times story linked above, the NFL makes about $10 billion a year, so the payment of $765 million over 20 years — while not exactly chump change — is likely to be only a tiny fraction of the League’s revenue during that time period. The players, however, get certainty and immediacy, rather than the prospect of continued litigation over the next few years and an uncertain result, which is important if you are battling neurological problem or other issues that you claim were caused by concussions you received during your NFL career. On the other hand the NFL, which is the most PR-savvy of the professional sports leagues, avoids the sad and unseemly spectacle of crippled and addled former star players parading before a jury to show the degree of their mental injuries. The American public loves football and loves the big, bone-jarring hits that the NFL provides; it’s why the NFL is easily the most popular sport in the country. Those who played the game received lucrative salaries and adulation, but paid a high price. It’s very troubling to see men who were once premier athletes hobbled, mentally and physically, to the point where they cannot walk unaided or remember what they have done during the day. I’m not sure that any amount of money is really adequate compensation for what those men have lost. One other point to consider, as the Obama Administration apparently entertains the possibility of military action against Syria: how much of our analysis of this situation, and our options, is colored by our adherence to concepts and a worldview that are outdated? In the ’50s and ’60s, our intervention in Vietnam and elsewhere was justified by “the domino theory,” which held that countries would topple like dominos into the Communist column if we didn’t intervene through military force or some kind of CIA scheme. Our approach to foreign governments relied heavily on the money-oriented, Marshall Plan model that was so successful in western Europe after World War II. Fifty years later, the Soviet Union is gone, the geopolitical map has changed, and our focus is on countries far away from western Europe and southeast Asia — yet the old themes play out, again and again. The colossal sums we have spent in Afghanistan and Iraq, and Colin Powell’s “if you break it, you bought it” argument, have their roots in the Marshall Plan notion that if we spend enough money we can rebuild countries into grateful and dependable allies. Advocates of our military intervention in places across the globe argue that we need to do so to prevent other countries from following the same course — like dominos. We have wasted billions in Iraq and Aghanistan, with money going to corrupt politicians, village chiefs, and “warlords,” without much to show for it in terms of our geopolitical security. And the domino theory doesn’t seem to apply to the Middle East, the focus of our most recent interventionist exercises, where neolithic tribal animosities and sectarian disputes that we can barely begin to comprehend have far more force than the events in the country next door. The Assad regime in Syria is brutal and murderous. Why do we think that a military strike to allegedly cripple its chemical weapons capabilities will change that? And, if the Assad government falls as a result, why do we think its ultimate replacement will be more peace-loving or accepting of western notions of diversity and democracy? If we don’t have assurances on those points — and we don’t — why should America become involved at all? Some might call this mindset isolationism. I think of it as an effort to focus on our country’s vital interests and to husband our blood and treasure until those vital interests truly are at stake. I just don’t see what is happening in Syria, tragic as it is, as involving our vital interests.